"There is always something going on at our home – my children keep me busy all the time. At work, I am also on my feet all day. This is why I pamper myself with a relaxing time-out once a week in order to re-energize. When I do so, I also take a lot of time for my feet." Sophie removes excess hard skin from her feet once a week using the Amopé Pedi Perfect™ Electronic Foot File with Diamond Crystals. 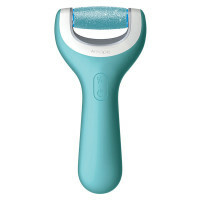 The Micralumina™ roller head gently exfoliates any rough patches of skin in less than two minutes. Next, Sophie treats herself with a soothing and relaxing foot soak. Use after the Amopé Pedi Perfect™ Electronic Foot File with Diamond Crystals to remove the last skin scales. If Sophie has more free time during the week, or if her feet need more intensive care, she uses Amopé Pedi Perfect™ Daily Moisturizer. Its special ingredients keep her feet hydrated all day long. If Sophie’s busier than usual in the morning, she uses Amopé Pedi Perfect™ Extra Rich Skin Recovery Cream before she goes to bed. This nourishes the skin on her feet with, long-lasting moisture, and prevents it from drying out. Amopé Pedi Perfect™ Extra Rich Skin Recovery Cream can be left on overnight, underneath socks – allowing its powerful ingredients to take full effect. And if needed, Sophie can apply the cream during the day too.